Everybody knows that the PHP community is very active and boasts numerous enthusiasts who want to share their knowledge with each other. After all, PHP is a powerful programming language, with a simple structure and yet offering tons of possibilities. But did you also know why the logo of that community is an elephant? Vincent Pontier, who created the logo, explains this himself: when you look at the letters “PHP”, you will see – with a dash of fantasy – that they form the shape of an elephant. And this is how the elephant became the PHP mascot. With such an animal in your logo, there is no better central theme than a jungle for the PHPBenelux Conference. 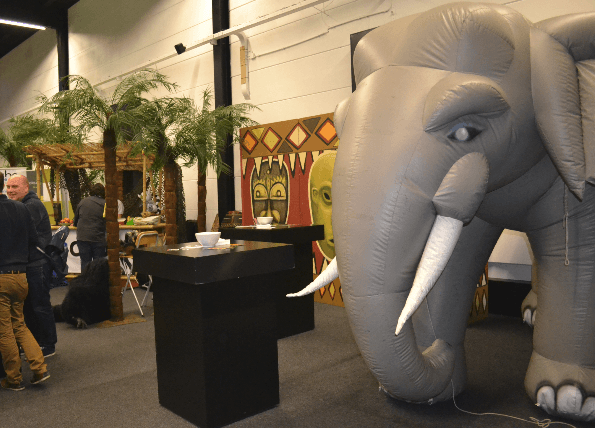 During the PHPBenelux Conference, which was held in Antwerp on 29 and 30 January 2016, an impressive jungle theme could be found absolutely everywhere. In the first place, a one-meter tall elephant welcomed all visitors in the parking lot. The central room was decorated in a jungle style, with bamboo and palm trees, and yet another (full-scale) elephant in its middle. Even the conference rooms were decorated in this jungle style for the occasion, with boxes used as rostrums. No fear of elephants… and snakes! All sponsors responded creatively to the jungle theme. PHPro allowed visitors to unleash their primal side with a boxing machine – the 5 best “PHPunches” won a headset. Web store Coolblue made a carton jungle using its well-known blue boxes; the prize they offered was a BB-8 (the mascot of the new Star Wars movie). As for ContinuousPHP, they gave the opportunity to build an elephant with Lego blocks and get the chance to win the coveted elePHPant. Other sponsors offered the chance to win an elePHPant or make a picture in a jungle setting. 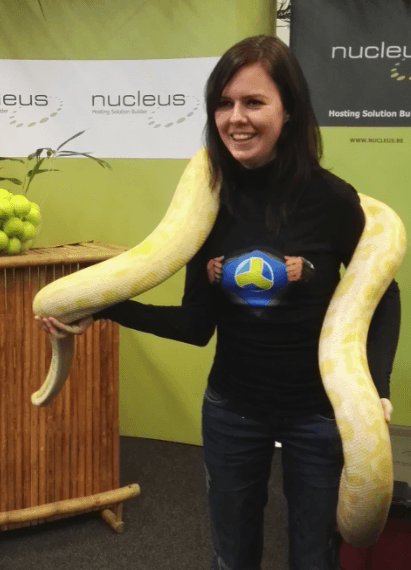 For adrenaline junkies, our colleagues at Nucleus even came with a full-grown living snake. The most courageous visitors could wear it around their neck, in order to guess the weight of the animal, which was very docile, yet extremely cold to the touch. Anyhow, Combell collaborator Romy proved that the people at Combell are not cowards: she wore the snake around her neck as if it were a living scarf! Other entertainment equipment (like a pool table, a pinball machine, retro games and an Xbox) did not fall under the jungle theme, but it was no less funny for all that. By popular demand, the bumper cars, which were all the rage 2 years ago, were there again. 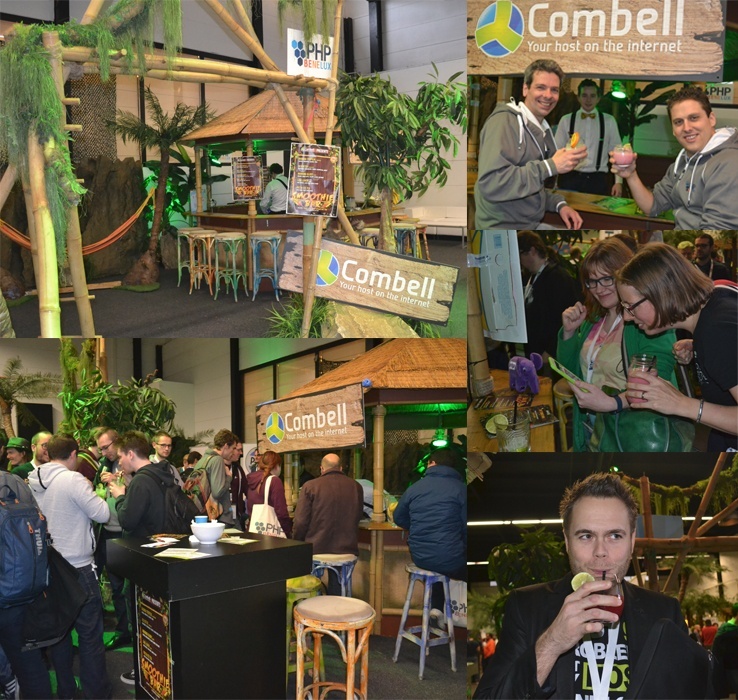 In the past, Combell often came with an ice cream truck to events such as this one, but this time, in order to stick with the theme of this conference, it came with a smoothie bar full of exotic drinks. In this spacious bar made of bamboo, delicious (and healthy!) fresh drinks have been mixed for two days, and served (for free) to all visitors. 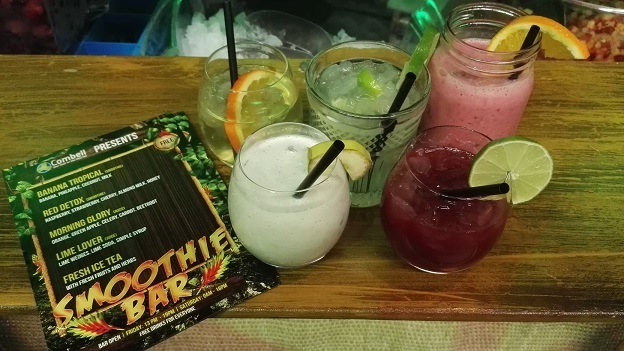 Banana Tropical, Red Detox, Morning Glory, Lime Lover, Fresh Ice Tea… All cocktails have been mixed on site using fresh fruit – a refreshment that everybody enjoyed, literally and figuratively! The smoothie bar was a huge success and received many compliments. In accordance with tradition, after the talks on Friday, visitors were treated to a feast of Belgian beers and fries – as well as many other attractions and delights. However, this conference was mainly about the riveting talks, with Cal Evans as keynote speaker. Many subjects were broached, and organisers had a tough time selecting the talks. As Thijs Feryn explained, they allowed themselves to be led by what is essential in today’s Internet era. Security: Cybercrime continues to get worse. The mainstream media report an increasing number of hacks, frauds and attacks. In order not to lose the confidence of consumers in the digital world, developers must make security their top priority, as explained in Eli White’s talk entitled “Web Security Essentials”. REST: RESTful services (Representational State Transfer) are everywhere, but only a few people know their ins and outs. REST is essential to allow separate software components to communicate with each other. Many frameworks make it possible to build RESTful services in no time. Check out Enrico Zimuel’s tutorial entitled “Develop RESTful API in PHP using apigility”. Automation: The automation of deployments and the automatic setup of infrastructures is paramount for developers. Doing this manually would indeed take too much time. Alternative database technology such as NoSQL allows to work more efficiently on a larger scale. This allows you to handle Big Data more easily. PHP7 is available! What can you do with it and how can you run a PHP5 code on a PHP7 runtime? Find out more in Patrick Allaert’s talk entitled: “PHP Data Structures (and the impact of PHP 7 on them)”. Refactoring and modernising legacy code, with a talk by Anna Filina: “Rewriting 12-year old code”. Automatic testing and quality assurance, so that you can guarantee that your code is bug-free, and that it will produce the same results in production and on your computer. Extensions, packages, libraries – working with external code and managing it. You do not always need to reinvent the wheel! Dependency management made easy. In short, very practical talks on subjects that can be used directly by all participants. You can read some of these presentations via the slides that the speakers have used and later posted with the #phpbnl16 hashtag. The comments on joind.in clearly show that people really appreciated the various talks and tutorials (and the juice bar!). The many Combell collaborators also enjoyed this edition a lot. And the organising team, including Combell tech evangelist Thijs Feryn, can be very proud of this achievement!